Jon and I went out to dinner with a friend recently and had Thai food. It just so happened that the next night we went out with different friends and also had Thai food. There was a part of me that thought, “Thai food again?” But then I laughed and thought, “Well Thai people eat it every day.” And then I laughed even harder at myself because Thai food is delicious and what the hell was I complaining about?? You might have seen that our Thailand and Laos Women-only tour is coming up in the spring of 2017! There are so many fabulous reasons you should join this tour but not least of which is the food. Here are just some items you’ll sample if you join this trip! I’ve been traveling to Thailand since 1992 and fairly regularly over the past eight years. 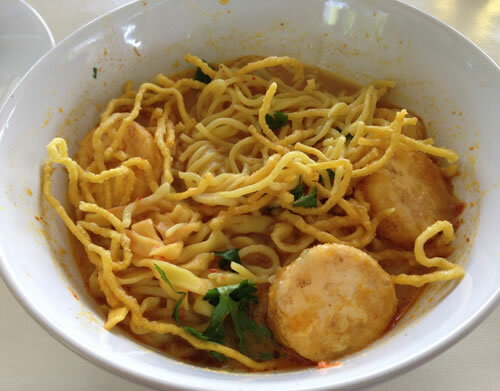 But it wasn’t until our 2014 tour that I discovered khao soi. This is a wonderfully-spiced soup with crunchy noodles. I love a bit of crunchiness in my soup so this is the perfect dish for me. The above version has tofu in it. Don’t worry, there’s plenty of meat to be had, but I stick with the tofu. 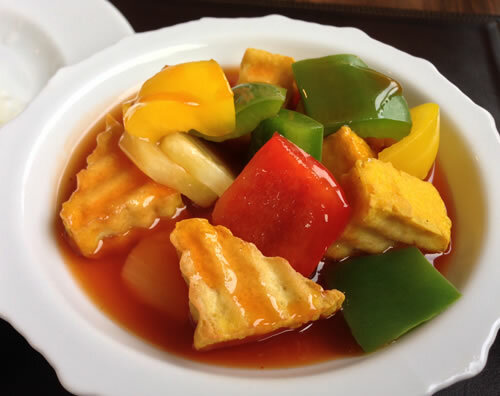 This has vegetables in a sweet and sour sauce. It’s a simple dish but just too pretty not to include here. 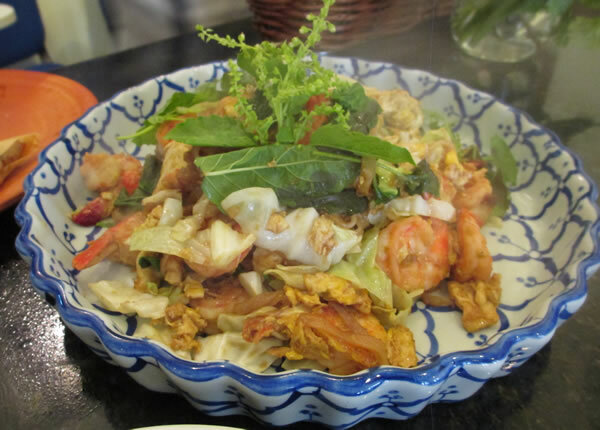 It wouldn’t be a Thai meal without a noodle dish! 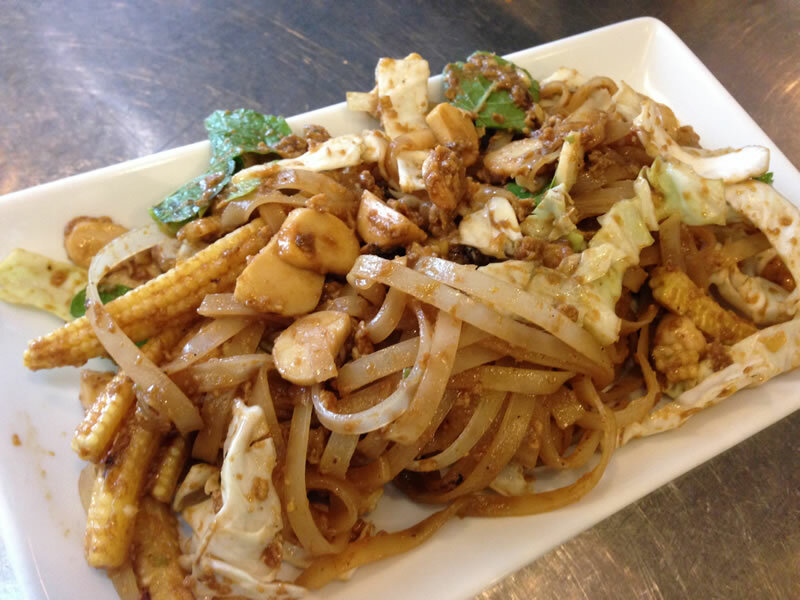 Phad Thai anyone? More noodles and veggies. 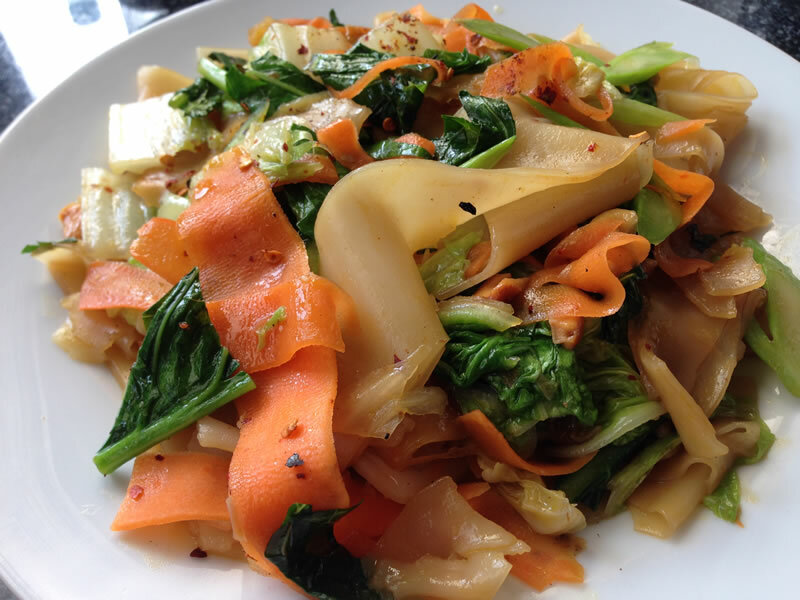 One of my favorites – Phad See Ew. One of the most fun things about Thai food is how beautifully-prepared it all is. 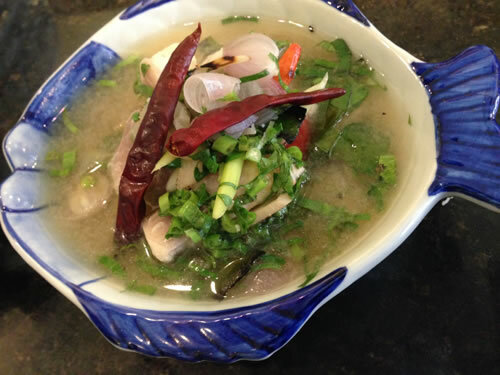 This is soup we learned how to make during our cooking class at the Blue Elephant cooking school in Bangkok. The class took the mystery out of cooking Thai food and the results were so yummy! More food we prepared in our cooking class. Not bad for a bunch of amateurs! 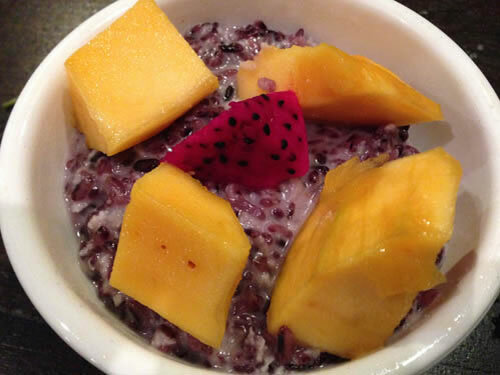 I love black rice pudding. LOVE it. Here it is with fruit. Have you every had it? You should. It’s even possible to buy black rice in some stores so you can make it yourself. 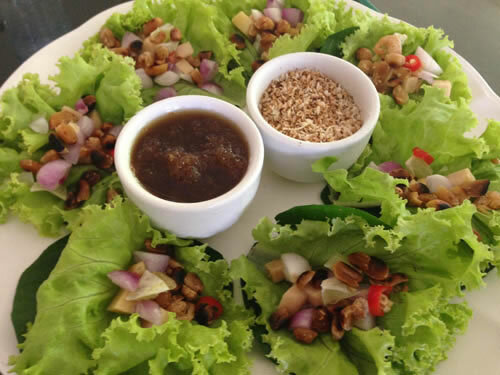 Our women-only Thailand and Laos tour for 2017 has space available and we’d love for you to join us so you can experience this array of food! Feel free to contact me if you have questions.